Strawberries are a delightful treat for thousands of home gardeners every year. The sweet rush of flavor that comes after sampling the distinctive aromatic profile makes for a truly rewarding experience early in the growing season. Strawberries are one of the first fruits to be harvested in virtually every temperate region of the world, and the life cycle of the strawberry plant is uniquely suited to bearing an early crop. Usually before spring even arrives, the strawberry plants are coaxed from their long winter’s slumber by rising temperatures and burst forth from dormancy in a fevered rush of vegetative production on their journey to setting a nice harvest of berries for the gardener who lavished care on them. But, in most areas, winter poses a real threat to the life of the little forbs. This post will help you successfully overwinter strawberries so that YOU can enjoy that first burst of juicy strawberry fruits each and every spring. Strawberries are relatively small plants, but they have a big productive capability. Due to their small size and easy adaptability, they make great ground plants and container plants. How to overwinter strawberries in containers will be discussed in the next section. Here the basics of overwintering strawberry plants in the ground will be briefly discussed. Extensive details on caring for strawberry plants can be found on the comprehensive Growing Strawberries reference page. Overwintering strawberries in the ground is relatively simple. 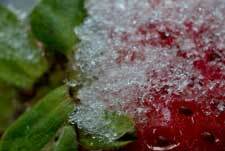 Strawberries are cold hardy, for the most part, and will survive mildly freezing temperatures without much problems. So, in areas with mild winters, little to no care may be required. However, in more northern (or southern for the Southern Hemisphere) regions, extra care will be required. That care takes the form of mulching. Strawberry plants must have protection when the temperature drops into the low twenties. Once that temperature has been reached (usually in December), the plants should be in their dormant stage. At that point, it is time to overwinter them by mulching. For most regions, a mulch of straw or pine needles two or three inches thick is sufficient, but in colder regions more insulating mulch should be added. Again, more specifics about in-ground overwintering strawberries is available on the reference page mentioned above and on this page: How to Mulch Strawberry Plants for the Winter. Overwintering container strawberries takes a bit more effort than overwintering in the ground, but it is still easily accomplished. Added difficulty comes from the susceptibility of containers to heat transmission. Terracotta pots and strawberry planters (as well as plastic ones and Topsy Turvy planters) do not have the added protection of extensive amounts of insulating soil surrounding the potting soil and potted strawberry. Because of this, container strawberries are much more at risk of freezing to death outside and must be further sheltered from the elements during the biting cold of winter. The easiest way to do this is to simply put the pot or container in an unheated garage near an internal wall. This will allow the dormant plant the protection it needs to survive. And, the prolonged darkness in the garage will actually help maintain dormancy. Covering with a towel or other opaque material can also help in that respect. When the temperatures start to warm, simply take the containers back outside for the next growing season. The rising temperatures will revive the plants from dormancy, and production will commence again. Just as with storing bare-root strawberry plants, your overwintered strawberries still have to have appropriate water. Totally dry soil means dead plants. Too much moisture can also be fatal. During the cold temperatures and while the plant is dormant, only minimal water is needed. For outdoor, in-ground, and mulched overwintering strawberry plants, the natural precipitation should appropriately maintain sufficient soil moisture. For the container plants, however, water will have to be provided. 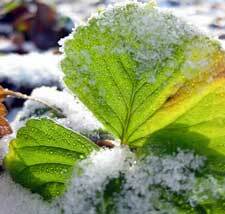 The easiest way to provide appropriate water is to collect snow from outside and throw a handful or two on top of the soil. The slightly warmer temperatures in the garage should slowly melt the snow allowing a more natural seepage into the container soil. Doing this periodically (about once a month) should sufficiently moisten the soil and allow the plants to thrive again come spring. Strawberry plants have a dormant phase for a reason. It increases their life span! Strawberry plants can be kept inside at warmer temperatures all year round, but this essentially causes the plants to never “sleep” and drastically reduces the overall life span of the plant. Strawberry plants are perennial by nature. Letting them go dormant during the winter as nature would have it allows for maximal production from each plant. Since strawberry flowers should be pinched during year one for spring plantings, the second, third, fourth, and even sometimes fifth years are where production really comes on strong. Protecting dormant plants during the winter yields much more production following. If you overwinter strawberry plants successfully, you don’t have to buy them again the following year. And, since they’ll live longer, you don’t have to replenish them as often either. Plus, since overwintered strawberry plants are more productive than plants that are never allowed to go dormant, you get to eat more of your own strawberries; and that means you’ll be saving money by not buying strawberries at the grocery store or farmers market. And, lastly, it is just plain fun to overwinter strawberries! They don’t suffer cold injury, and it brings a true green thumb at least a modicum of satisfaction knowing that his plants are kindly looked after. So, save yourself the work of replanting new plants each year and overwinter strawberries henceforth. 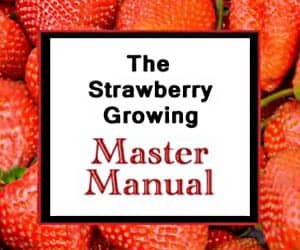 Hopefully, you are now equipped whether you needed to know how to overwinter strawberries in containers or how to overwinter strawberry plants in the ground. Following the advice on this page and elsewhere on this site will help keep your plants productive year after year. So, have fun, save money, and maximize your harvest! And, if you have any strawberry-related questions, feel free to leave a comment. Good luck! Hi, not exactly sure of my zone, I’m in Edmonton, Alberta Canada. We are renting and they have the most incredible strawberry patch, think they are evergrow? ?, anyway, we may move before spring and were wondering how and when we could take some of the plant with us?? I live in coastal southcentral Alaska. I have been overwintering my strawberry containers under a layer of mulch and than a plastic tarp with excellent success for years. This spring when I uncovered them I found shrews had totally wiped out all the containers, eaten all the plants. How should I overwinter them this year to prevent this from happening again? Hello, I live in southern Ontario and I am looking to winter two strawberry plants. Last year I had one, and I didn’t know to put mulch and it didn’t regrow. I bought a new one early spring, and planted some of the off shoots in a second pot. I have a corner where my fence meets my house and have moved the pots there, where they are sheltered by my rose bush a bit. Our dryer vent is nearby, so it stays a bit warmer. Can I cover the leaves with burlap to allow moisture in but keep snow off the leaves? There are pinecones and leaves nearby that I could add also…my local stores have stopped carrying mulch. Can I use clear plastic to cover my strawberry plants. I am in zone 6. I have each year used white plastic. Strawberry farmers use white plastic in my area. But I was given a roll of clear plastic and I was wondering if it could be used. I have strawberry plants in half barrels. I live in zone 6 and the winters are sometimes too cold to leave out. Would you suggest putting the barrels in my greenhouse and not using a heater? I read to water sparingly and cover with towels to keep dormant. Do you recommend this plan? I just bought some strawberry plants and had planned to plant them in a large (4 ft. diameter, 18 in. deep) tire which has been turned into a planter. I am in zone 3 and am now concerned they might not over-winter since they will not be planted directly in the ground. The planter is too large to easily bring inside during the winter months. Thoughts? Opinions? Thanks so much! I am enjoying your site and learning a lot! I have a strawberry plant in a planter outside about 14×14 inches, I am in canada and I left it outside for the winter up against my garage wall, it got down to at least -30 celsius this winter but it was always insulated with snow. will they come back or should i compost and start over? I also had lots of runners, should I cut them all back if it will survive? I have not mulched my strawberry plants yet because the ground temperature was still 40 degrees. We just had about three inches of snow. The air temperature is in the 30s and will be in the 20s tonight, 30s again tomorrow. The day after tomorrow it is expected to dip down into the teens at night but be near 40 in the daytime off and on for the rest of the week. Should I get the snow off the plants and mulch before the air temperature is in the teens? I understand the snow is probably helping insulate the plants at this stage and I’m not afraid of them getting damaged but I wonder when to mulch. Thanks. The ground temperature is more vital than the air temperature. 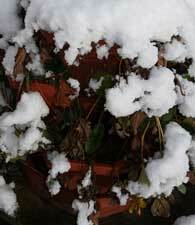 The snow will insulate the plants at this point. Once the snow melts, go ahead and clear off the dead top foliage and then mulch. Good luck! I saw a video once of a fellow who had really long bags of soil and he was taking strawberry plants, roots exposed, and shoving the root systems into the bags. He had stored them over the winter and was planting them for the new season. This got me thinking about how on earth he had stored those plants over the winter… Can strawberries be removed from the soil and then stored? I’ve never had a video bring up so many unanswered questions. They can, but it isn’t advised unless absolutely necessary. See this for more, and good luck! I am overwintering in containers, zone 4. My plan is to place them along and outside wall in my garage, which is not heated, but houses my furnace and water heater, thus staying warm. How cold do the plants need to be to stay dormant? I am a bit worried with the warmth in the garage that they will not stay dormant. In Zone 4, your plan should work just fine. Good luck! My strawberries are planted in planters on my fence. Some of the planters need repairs requiring removal of the plants. If I were to plant them in my raised beds for the winter, when would be the best time to do that? Could they then be replanted in the planters in the Spring? They are producing fruit right now. I’m in zone 6b and our average last frost date is October 3rd. Thank you for your help. If you need to transplant, it is best to do it in the fall. Doing so allows the plants to re-establish themselves prior to going dormant, and they will have a better survival rate that way. However, re-transplanting them again in the spring will add additional stress to the plants, and they will likely not produce as well for you following the spring transplantation. So, if you can leave them in the raised beds next spring, they will probably do better! Good luck! 1.) Can strawberry plants be cut back or mowed over in the late fall? 2.) How do you properly thin them out? 3.) Little black, spotted beetles are attacking the strawberries and raspberries. Is there a natural way to get rid of them or is pesticides the only effective method? If pesticides, what kind? See this for strawberry renovation. Good luck! In getting ready for winter, can strawberry plants be cut back? – if so, when and how? This year I have had a problem with little, black, spotted beetle critters eating the berries. What are they and how do I get rid of them? They are also attacking my raspberries. I am growing two types of strawberries: Ozark Beauties and Quinlan – (I believe). Yes, the plants can be cut back or mowed after the harvest is in and renovation starts. To remedy the beetles, you might want to try regular applications of diatomaceous earth. Good luck! I read a lot of these and my situation was not mentioned that I saw anyway. I do not have an unheated garage, Greenhouse or root cellar. Unable to dig holes in ground for containers. Etc and mine are in the five tier containers. I have a shed or a enclosed porch. the porch would be easier to keep them watered as the shed sometimes get a ton of snow in front of it or iced up and I can’t get into it. I live in zone 5 in New York, upstate. Would the enclosed porch be okay if I brought them in when there was an extended period of Below 32 degrees at night? or should I wrap towels around them ?what kind of insulating material could I put around them if I left them on the porch? In Zone 5, putting them in the enclosed porch against a house wall would likely be enough to keep them alive through the winter as long as you water them periodically to keep the soil from drying out. If the temperatures are forecast to be really low, just through a could of old blankets over them until the temperature warms a bit. Good luck! I just bought strawberry plants (through a school fundraiser) and I want to put them in containers as I don’t have garden space. I live in zone 3 (Southern Manitoba). What is the best type of container to use so that they will over winter best? I’ve seen the plastic or terracotta pots, but also have seen interesting vertical designs using PVC tubes. I would bring them into the garage for winter, and it stays around -2 to -5 Celcius in winter. I would advise against the PVC tubes if you are planning to overwinter them. They are much more difficult to insulate. Any container in your location will require a bit of extra work to insulate, but if you can bring them into a garage to protect them, most will do adequately. Overwintering outside in pots of most any kind will likely result in the entire contents of the pot freezing through and ultimately resulting in significant cold injury or the death of the plants during the coldest months. If you need to keep them outside, if you have a space in the ground you can dig up, you can dig a pot-sized hole in the ground and put the pot in the hole. The ground will insulate and a liberal blanket of clean straw will probably keep them alive over the winter. Good luck!